If packing a travel journal & taking time every day to write down your adventures sounds overwhelming, here’s my secret: Postcard Travel Journals. My inspiration: For years as I was traveling the world, my mother continually gave me travel journals as gifts – reminding me to take time to write down all my amazing experiences. Unfortunately, I was always too busy having fun to stop and “journal”, however I did keep in touch with my family by sending postcards: quick & easy. Well, guess what? My mother knew I wasn’t writing in my journals so she kept every postcard and letter I sent over the years and gave them back to me as a gift 15 years later. I now have all those fantastic memories as keepsakes (some I don’t even recall) Thanks mum! Here’s what I do now: As I travel, I purchase postcards of my favorite sites, historical and cultural (including hotels, most of which have their own free postcards). I pop a few in my day bag and while I’m having lunch in a café or riding a train through the countryside, I jot down a special memory of the day or describe a favorite restaurant and its location. Then I purchase the most interesting stamp I can find and mail the postcard – to myself! The best part is I receive mail when I get home. It’s fun to see how long it takes to receive mail from different parts of the world. Once received, here’s what I do: I punch a hole through the upper left hand corner, tie a ribbon around all the cards from each trip and place them on my coffee table. These “postcard travel journals” make great conversation pieces and the ribbon looks attractive while keeping all the cards together (I also use 1” book rings from the office supply store). After a while, I pack the postcards in a box that I’ve decorated with a map from that trip. It’s an easy way to reference the trip, and when a friend asks, “What was the name of that great restaurant you raved about in Florence?” I can locate it easily. Visit a souvenir shop upon arrival in a city and look at the racks of postcards. 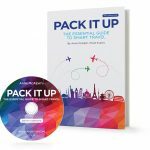 This gives you a quick visual of many of the famous sights and areas in the city and helps you make a list of perfect photo opportunities. When you’re printing your digital photos, print some to use as postcards. Collect postcards on your travels and use them to decorate your scrapbook, fridge, or to make a collage under glass on your dresser or coffee table. Display family postcards in shadow boxes. Ask your parents and grandparents if they have any old postcards. They are great conversation starters and a window to family history. (Hint: They are usually stored in old luggage or trunks). 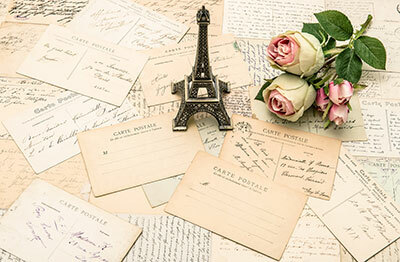 Antique postcards are a fun item to collect and can be found in most cities worldwide. Upside: They are lightweight and pack flat in your bag. Another option for displaying your postcards is to cut a window in a scrapbook page, making both sides visible. Decorate your packing board with postcards from your adventures.